The most traded currency from Latin America, the Mexican Peso is Mexico’s national currency. 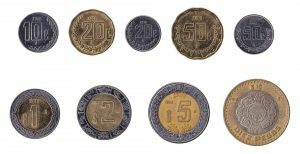 Following years of hyperinflation, the Mexican Nuevo Peso was introduced in 1993, replacing the old Peso at $1000 old to $1 new. The word ‘Nuevo’ was later dropped. At Leftover Currency we exchange Mexican Peso banknotes, current and older series, as well as Mexican Peso and Centavos coins.